Here I continue to post snapshots of the conservation work ahead for our upcoming new exhibits. The Alaska State Library Archives and Museum (SLAM) project is in the construction phase, with opening of the new building planned for June 2016. There are approximately 22 interpretive areas, around 90 exhibit cases, and roughly 2,500 objects. This section is about World War II, an area of the collection that has grown significantly in the past few years. This is one of the areas that will be mannequin-intense, as we have quite a few uniforms from different service branches. 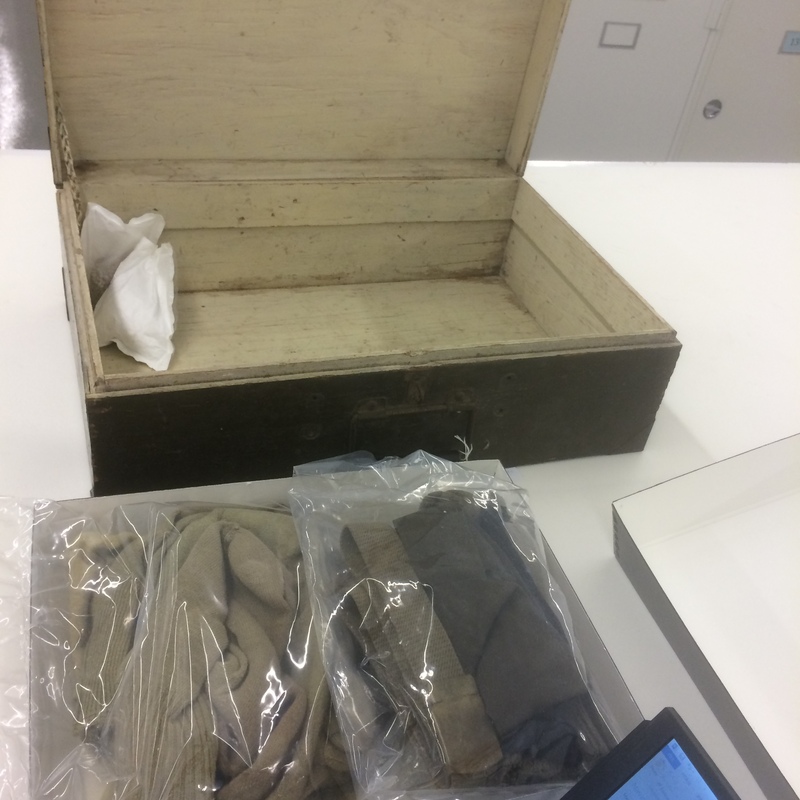 Here are some of the artifacts that need some extra care from conservators. ASM 2013-61-1 these remarkable fleece lined pants from the Army Air Corps have some tears that need to be repaired. 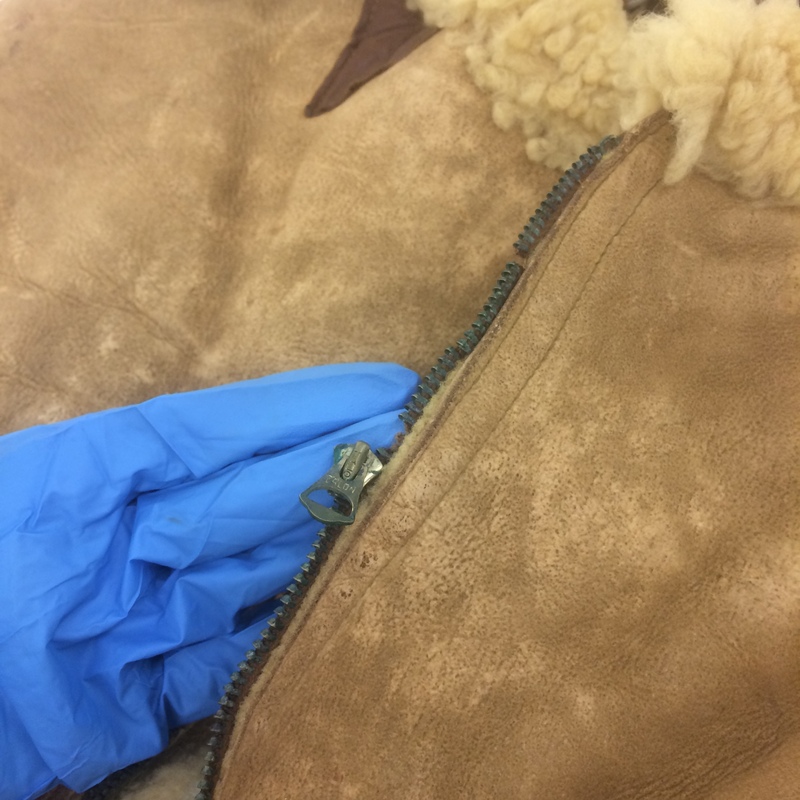 The zipper of the pants suffers from tooth loss and corrosion. This needs to be stabilized, and the display details strategized if the zipper cannot be zipped. This barracks box from the Aleutian campaign (ASM 96-59-1) contains clothing that must be addressed. 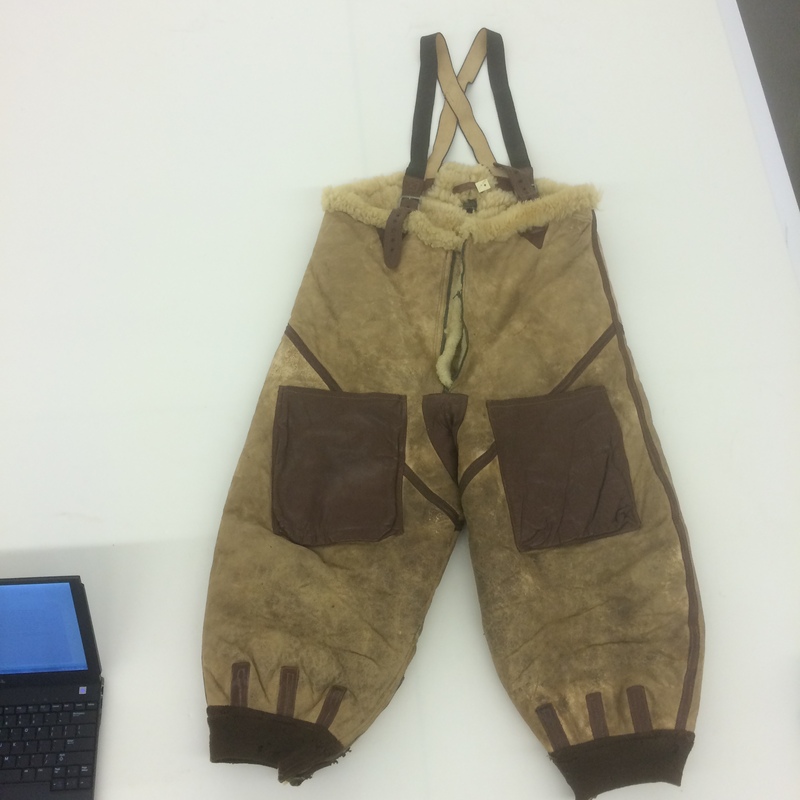 It may need to be vacuumed, and the arrangement and support of the garments in the box needs to be determined with aesthetics, interpretation, and long term preservation in mind. 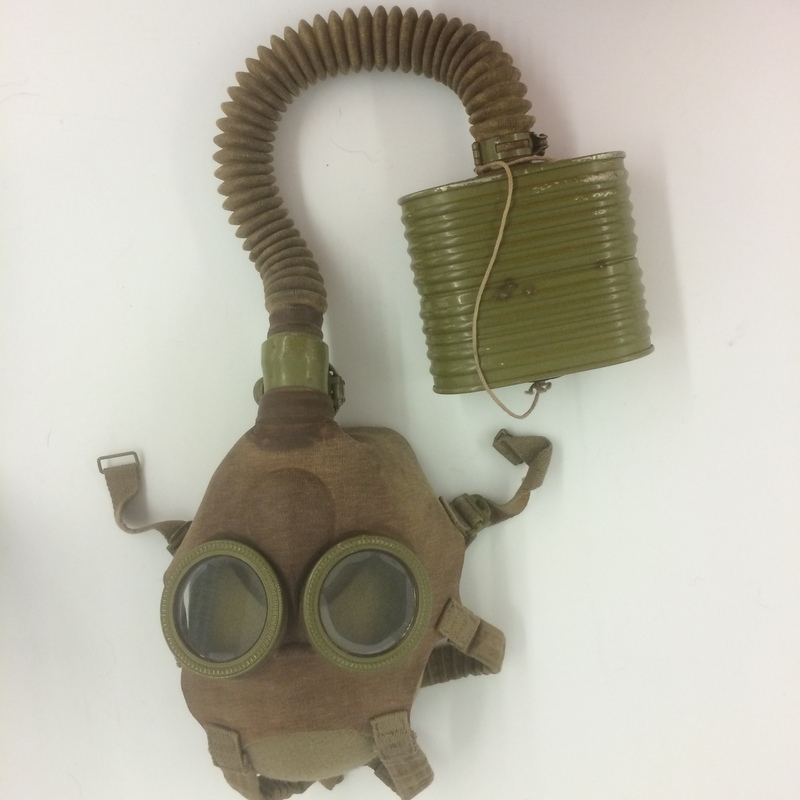 This gas mask, III-O-165, has a lot of rubber components that are still flexible, but who knows how long that flexibility will last? Can we come up with a support system that will allow the item to be interpreted and studied in the future even when it gets stiff? 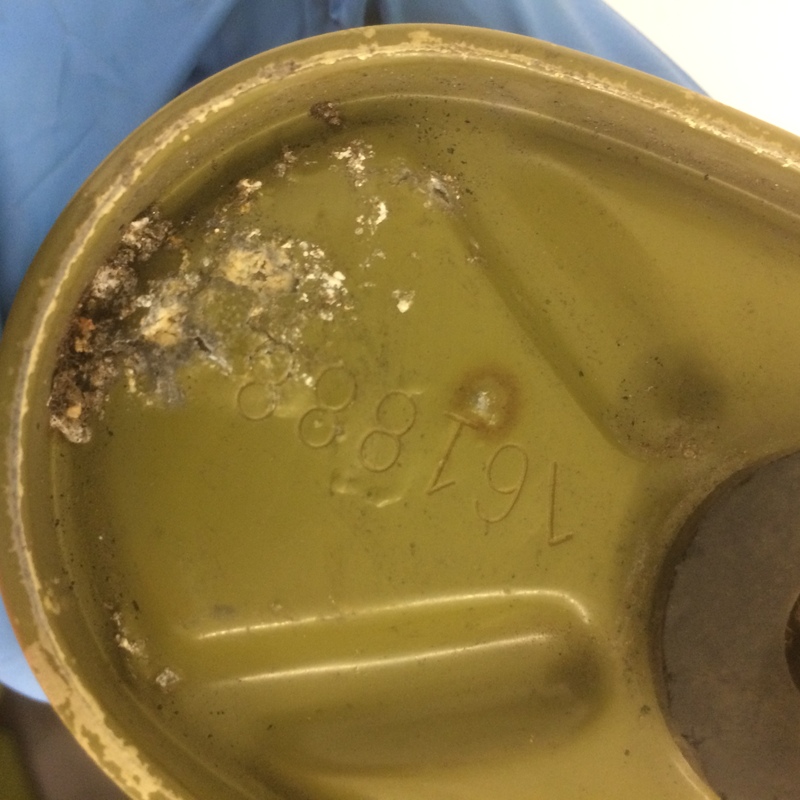 The canister of the gas mask has some corrosion. This needs to be characterized and stabilized. 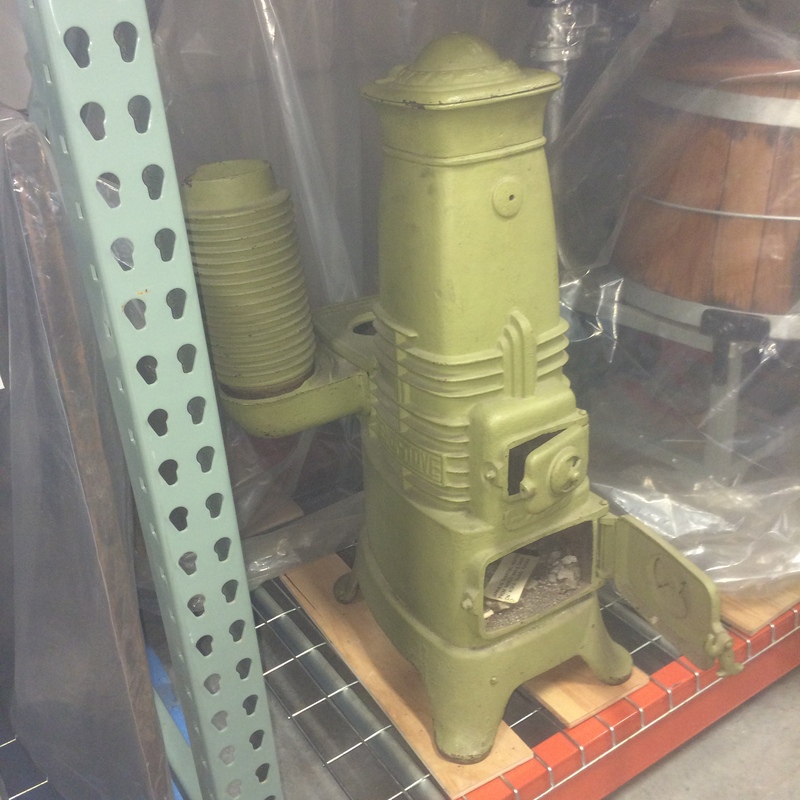 ASM III-O-364 is a Japanese charcoal burning stove. Staff here are very fond of its industrial design elements. The inside is full of dirt and rocks. We will need to determine if those are to be kept inside or not. 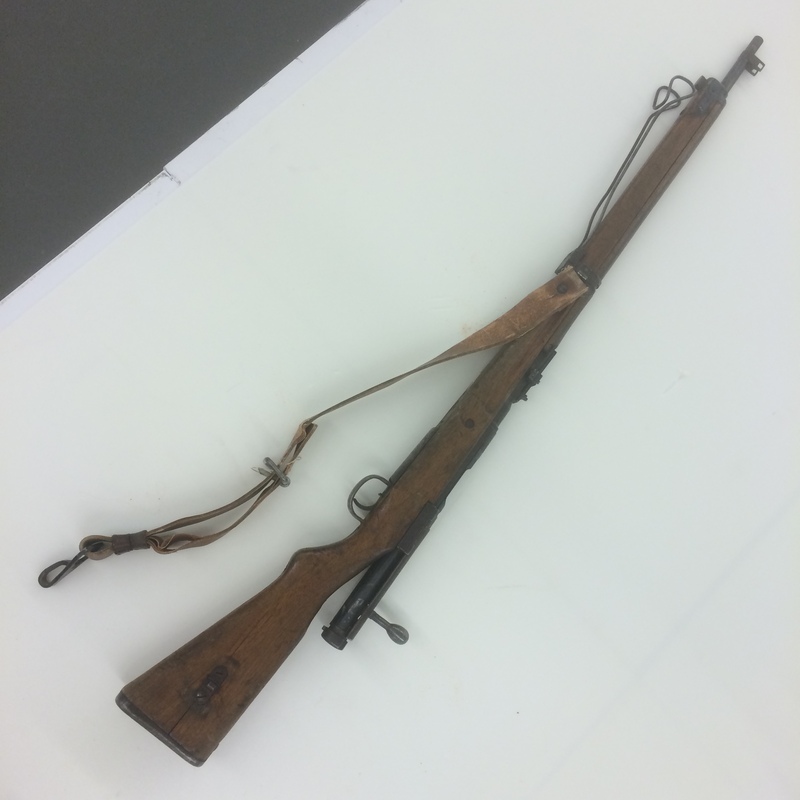 This Japanese rifle, III-O-240, has areas of corrosion and some elements that might be bent or out of position. It is an Arisaka Model 99 collected at Kiska. 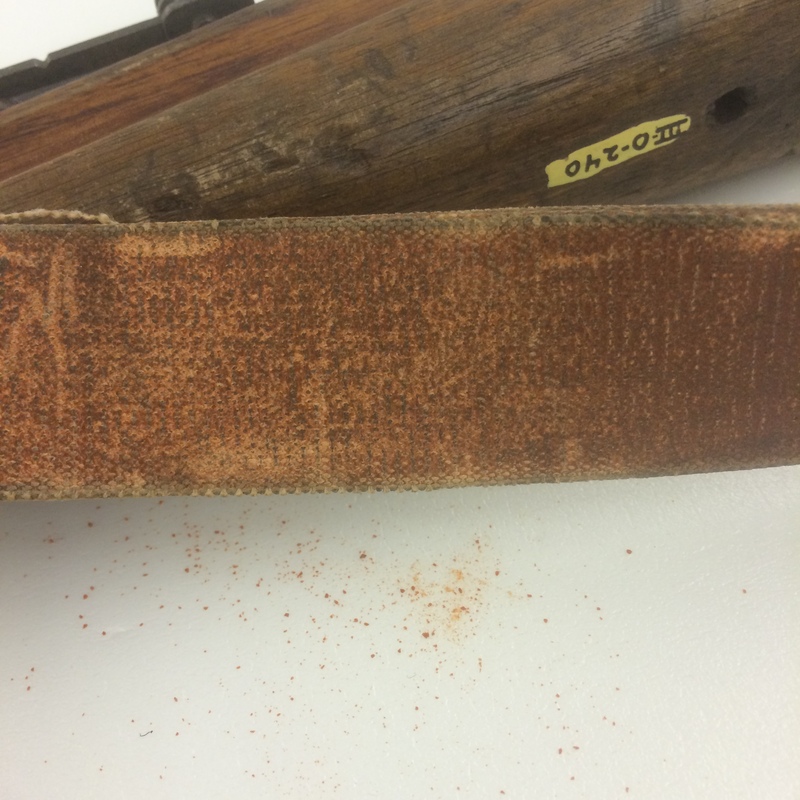 The strap of the rifle is actively flaking an orange powder. This material will need to be characterized and stabilized before it can go on display. 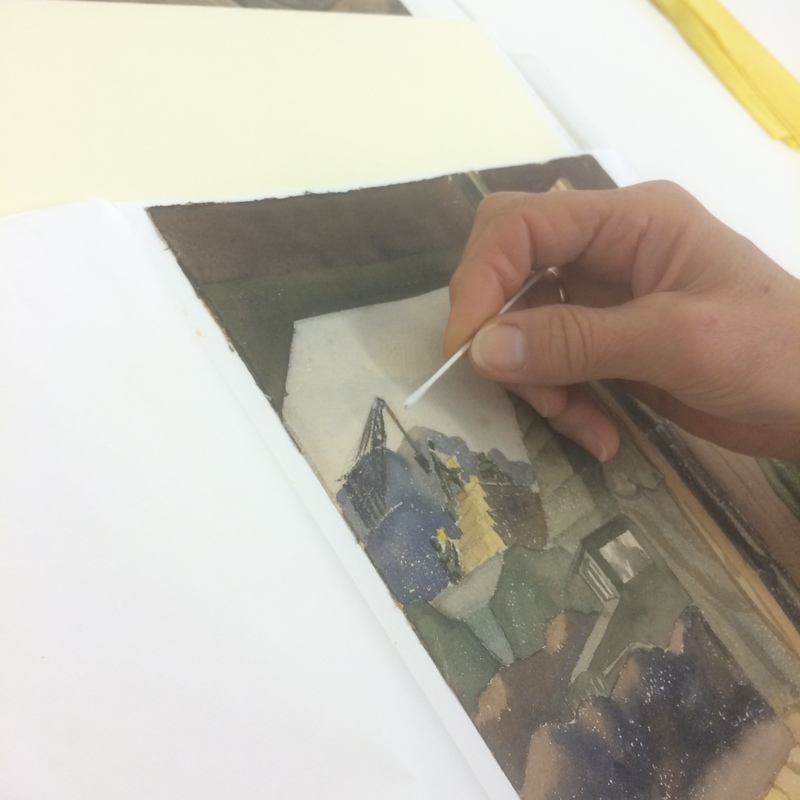 In this image, paper conservator Karen Zukor is examining and testing a watercolor painting from 1943 Adak Island by Warren Beach. 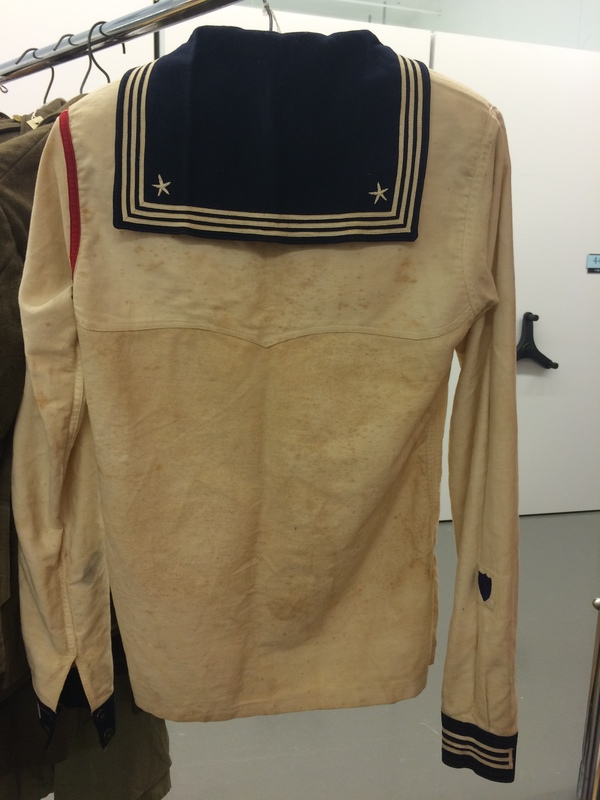 The artwork has some severe spotty staining on the back that is beginning to show through to the front. A later to posting will detail some of our strategies to control light levels in the upcoming exhibits. This painting will need treatment before exhibition. This entry was posted on Wednesday, March 18th, 2015 at 9:43 am and is filed under PROJECTS & IDEAS. You can follow any responses to this entry through the RSS 2.0 feed. You can leave a response, or trackback from your own site. Do you think the flaking leather strap might just be red rot?